Analog inputs : No. of inputs 1 No. 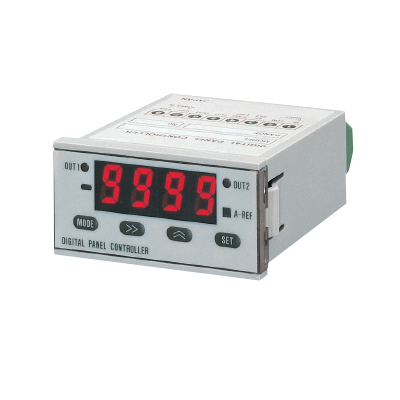 Analog inputs : Sampling rate Selectable from 200 times/sec., 20 times/sec., 10 times/sec. or 5 times/sec. Display : Display refresh rate Selectable from 20 times/sec., 10 times/sec., 5 times/sec., 2.5 times/sec., 1 time/sec. or 0.5 time/sec. (Measurement mode: Lights up when OUT 1 is ON. Blinks when display is changed to OUT 1 threshold value display. (Measurement mode: Lights up when OUT 2 is ON. Blinks when display is changed to OUT 2 threshold value display. Functions Auto-reference function, zero-adjust function, scale setting function, threshold value setting function, hysteresis setting function, comparative output timer function, start / hold function, memory clear function, power supply ON-delay function etc. Net weight Net weight: 55 g approx.